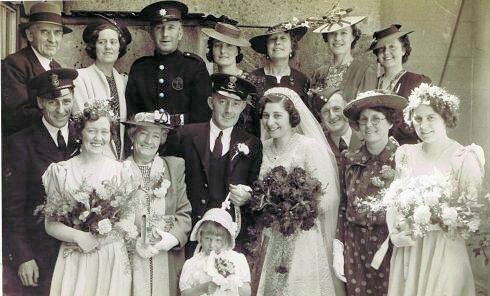 Petty Officer (Buddy) S J Hide marries Dorothy L Dredge at St Michael's Church in Lewes on Tuesday 2nd June 1942, just 11 days after arriving back from his epic escape from Hong Kong on Christmas Day 1941. Back Row L to R: Edward V Dredge, Margaret Parsons, née Hide, Bill Hide, Joan Thain néeHide, Lizzy Holder née Hide, Betty Holder, Kathy Hide. Front Row, L to R: Ted J Denyer, Mary Denyer, née Hide, Elizabeth M Hide née Turner, Buddy Hide, with June Young in front, Dorothy Hide, née Dredge, Horace Young, Mrs. Louisa M Dredge, née Cornwell, Mrs. Isabelle Young, née Dredge. Buddy Hide's eldest son, the late David Hide, talking about his father's escape from Hong Kong. The flotilla escaped with high ranking officials from battle HQ, and the legendary one legged Chinese Adm Chan Chak ROC from Hong Kong on Christmas Day 1941 as the Colony surrendered to the overwhelming force of the Imperial Japanese Army.